New Mills keeps on growing as far as music is concerned. 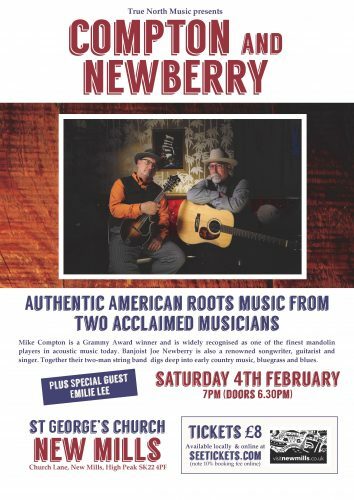 On February 4th the very popular Compton and Newberry join us at St Georges Church as part of their UK tour. Compton & Newberry are acclaimed as two of the finest artists on the bluegrass and Americana scene. Celebrated mandolinist Mike Compton took up the instrument as a teenager and was heavily influenced by “father of bluegrass” Bill Monroe. Mike’s musical CV is long and impressive; he performed with the legendary John Hartford for many years and was one of the original Soggy Bottom Boys, working with producer T Bone Burnett on the Grammy-winning soundtrack to the smash hit film O Brother, Where Art Thou? Mike has been an in-demand sideman and band member for decades, performing with everyone from Elvis Costello to the late Ralph Stanley. Talented banjo player Joe Newberry is also a prizewinning guitarist, singer and songwriter. He was a guest star on the UK’s popular Transatlantic Sessions live tour in 2016, and his award-winning songs have been recorded by artists including The Gibson Brothers and Ricky Skaggs. A frequent guest on the cult radio/internet show A Prairie Home Companion, Joe is a hugely charismatic entertainer who charms audiences wherever he goes. Tickets are for sale online here or if you want to pick up a ticket in New Mills visit High Street Books and Records in New Mills.